About twenty years ago we had a severe gale and a Pine tree fell across our driveway and rested on the guttering of the house.. We went outside to view the damage. I looked down the drive way and saw the walls of my brickbuilt garage bulging, as the giant Lime Tree next door, began to topple above it. My new car , my pride and joy was in that garage. So in I went started up and backed out, within seconds the whole garage crumbled crushing the walls and the outside loo ,also brick built , falling right across the seat. also hit the Show Bench carrying my best Bonsai, almost all in ceramic pots, Most others were in plastic pots and placed elsewhere. Removing the remains of the old Garage and rebuiulding a new one incorporating the Loo. Had to await Insurance examiners etc. Didn’t happen quickly as there were many other similar incidents after this very high wind. The tree trunk was so large A special saw had to be brought in to cut through the trunk .The new garage had a tiled roof instead of the Asbestos sheeting. So was a great improvemnt on the old one, I had to carry much of the cost myself as Insurance couldn’t cover improvements . 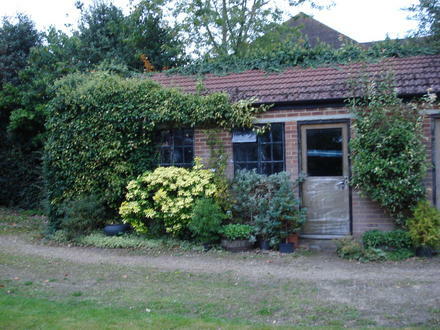 however it presented a solid brick wall to my neighbour, as the tree had come up with a large area of shrubs etc. that previously had screened it from their windows. I planted Pyracantha all alorg the back wall and on both sides of the .dooorway. ,it did in fact after a year or two look as if it had grown where it stood. . The wall facing our garden has Ivy Gold Heart.. Brachyglottis Sunshine. Choisya ternata. and Photinia Palette to keep it well furnished. 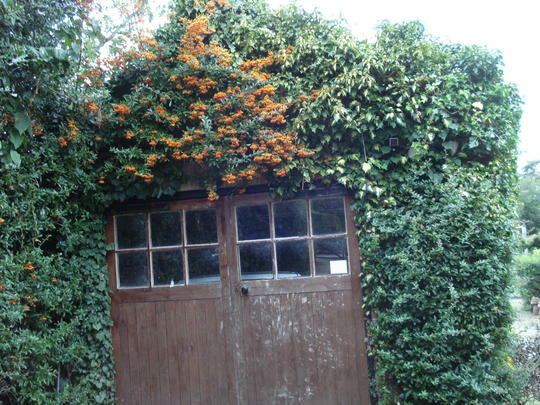 Brilliant garage disguise - what a shame about the bonsai though, was it many years of lost work? In a class with Patrick Blanc's Athenaeum hotel in London! Thanks Wagger. The tree produced a new Bonsai style, called crunch.. Reminds me though of a seedbed of various trees growing near a Fox's den. I was pleased not to have to worry about rabbit damage, However the Fox had cubs and they used to come and play on the green shading. I had quite a number of Bonsai starters with curving trunks. I remember that storm so well - being further north we weren't affected so much - it took the lid off my dustbin (remember those?) lifted the bag of rubbish out and took it I know not where. The south and southeast had it really badly, dreadful damage.